It’s time to do a product rave! Today I will be going gaga about my new Shu Uemura Black Compact Powder Foundation. 1) The product packaging. The glossy black compact case is sleek and contains a section that holds the sponge applicator. The foundation’s top also has the words “Shu Uemura” on it. I love it when makeup stuff have nice details like floral patterns or the brand’s name engraved or embossed onto the product itself. 2) The foundation hasn’t given me major skin problems, which is what I’m very prone to. 3) The foundation is silky and glides on smoothly, leaving my skin satiny, velvety soft. In fact, it’s the only foundation I’ve ever used that glides on so effortlessly. It’s a first timer for me. Totally loving this property of the foundation. It goes on better than M.A.C.’s Studio Fix or Shiseido’s compact foundation. 4) It’s made for Asian skin tone. Meaning: no pink undertones. This makes it look more natural. 1) Smell. It doesn’t stink nor does it smell nice. It just smells like normal foundation. The smell isn’t overwhelming. 2) Coverage. The foundation gives only medium coverage, nothing like M.A.C.’s Studio Fix once again, which gives a high coverage. I suppose this is Shu Uemura’s second powder foundation selling in Singapore. The other one comes in a silver/white (I forgot which) compact case and is more for whitening of the skin. The one that I have is more catered to oily skin and actually has more coverage than the other one. I’m considering getting their UV Underbase Mousse. The SA tried it on my skin and I didn’t break out. The texture for that seemed really light too. Plus, it’s got SPF 10. P.S. By the way, does anyone know anything about The Sloane Clinic? 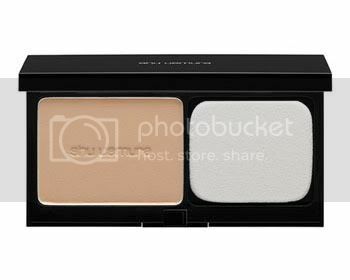 Shu Uemura’s Black Compact Powder Foundation was last modified: April 22nd, 2010 by Roxanne C.